Windsurfing - Fins & Sails | Crank It! There are fins present on the windsurfing board that can be replaced if anything ends up happening to them. Some people believe that these boards need to be placed right off the bat but this is neither always true nor necessary. Generally if you are buying a brand new beginner board, then the fins present on the board are also going to be designated for use by beginners, meaning that you should leave things the way that they are. The board is going to need a sail, otherwise it isn’t going to do you much good at all. There are a number of different types of materials that can be used for sales, and different qualities can be found from one to the next as well. Monofilm is one of the best choices for sail material. It is a clear material meaning that it provides an excellent amount of visibility, and it is capable of holding its shape, especially in comparison to other commonly used materials for sales. You also are going to want to check how soft a particular sail material is. Sails that are softer are going to be easier for you to use in general. For beginners, good materials are Mylar materials and Dacron materials. If you are an advanced wind surfer on the other hand, or if you are participating in a competition, then you should be looking for a more rigid sail, which is going to offer a greater level of speed in conjunction with a much greater level of control. The biggest rule that you need to follow when it comes to sails is that you should absolutely never buy a used sail for your windsurfing endeavor. These sails can easily become stretched out of their usual shape or they can sustain damage that may not be immediately noticeable. You are never going to want to buy a sail that is used and then end up being placed in a potentially hazardous situation because you made a poor decision about the quality of the equipment that you’re using. While many beginners do not put a lot of thought into it, you really should look into buying a harness. Having a harness for your wind surfing endeavor is going to keep you and your board from becoming separated. If you fall off your board, which is going to happen sooner or later, then you will not have to worry about losing your board. 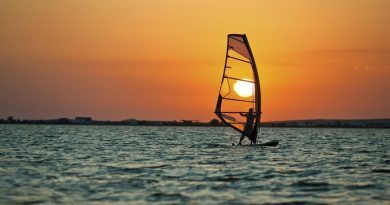 Even if you become more proficient at windsurfing, losing your board is a big deal and is something that you are going to want to avoid. If you get separated from your windsurfing board, you could hit someone or hit something with it, damaging your board or hurting someone, and it would leave you all alone in the water which reduces your ability to get back to shore and leaves you vulnerable. If you do not have a windsurfing harness already, you should certainly consider getting one in order to improve your experience.